Vitally's segmentation abilities give you the power to organize your accounts into any number of segments, using any data points. You can easily view each segment's accounts, KPIs, and more as you navigate Vitally. Vitally's Rules feature helps you automatically organize your accounts into any number of segments. 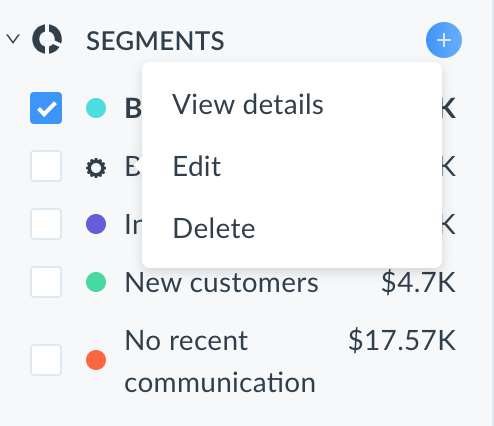 You can assign accounts to segments based on their product usage, subscription details like MRR or renewal data, market details (using our Clearbit integration), or any other data you send us. See our Rules documentation to learn how to create rules that automatically assign accounts to segments. Accounts can also be manually added to, and removed from, segments, allowing segments to essentially double as to-do lists. To manually change the segments account(s) belong to, either navigate to a customer's dashboard or select accounts in the main Accounts list. Click the segments icon in the top right and simply select the segments you'd like the accounts to belong to! Manually modifying segments supersedes automatic segment assignments from rules. For example, let's say some rules add Account A to Segment B. Then, in the UI, you manually remove Account A from Segment B. The rules that originally added the account to the segment will not add it back (although a new set of rules would, if created). The same is true in reverse - if you manually add Account A to Segment B, then rules will not remove Account A from Segment B. If you'd like the account to no longer be in the segment, you'll need to manually remove it moving forward. Once you've created segments, you'll see them displayed in the filters part of Vitally's navigation (i.e. the bottom left part of the screen). As you navigate the data views in the top left, you can select segments to filter the displayed data to. (For admins only) Navigate to the Segments section in your account's settings. There, you'll see a list of all segments with the ability to edit/delete each one.